Lock in a great price for MAX Hotel Garni – rated 9 by recent guests! It was located in a location close to the centre. Also, bunch of nice restairants in vicinity. We enjoyed our one night stay at MAX Hotel Garni! It was absolutely clean and comfortable. Communication was very good! Location is great! The staff is not just good. The staff is perfect! Very friendly and warm wellcomed people. Good breakfast. In your room you have free high class coffee Illy with Illy coffee machine. You also have mineral water wellcome drink. 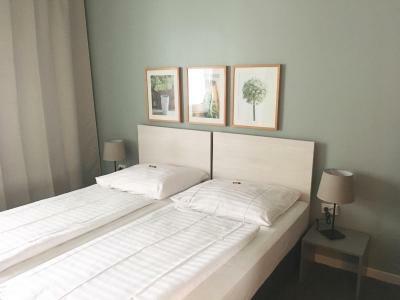 The location is very good - train station is 5 min walk and the old city is 10 min walk. Everything! 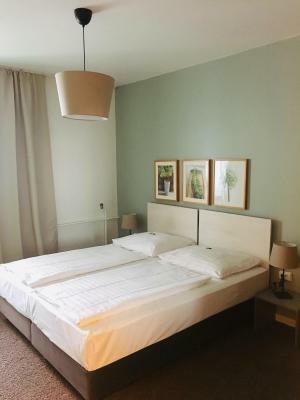 Great location close to supermarket, 15/20 minute walk into Dusseldorf centre, very friendly staff, spotlessly clean, modern, free beer/water/coca cola, beds very comfy and excellent value for money. Really clean hotel, with up to date decor and bathroom facilities. ideal for the station 15min walk to the centre. bus passes inc in price. Quiet location staff helpful, rooms and hotel cleaned to a good standard. Rooms were very nice Great value for money We were a group of 7 friends, hotel was perfect for us to see Düsseldorf for a weekend. We didn’t have the breakfast from the hotel so can not comment. It takes about 20-30 mins to walk to the Altstadt from the hotel, but free bus and rail travel was available with the hotel which we used. Overall a very pleasant stay. 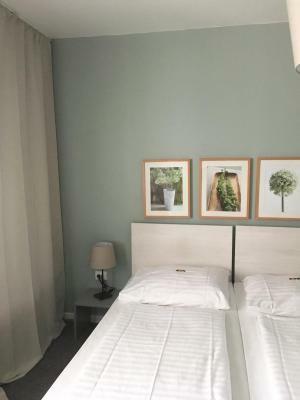 MAX Hotel Garni This rating is a reflection of how the property compares to the industry standard when it comes to price, facilities and services available. It's based on a self-evaluation by the property. Use this rating to help choose your stay! One of our best sellers in Düsseldorf! MAX Hotel Garni offers modern rooms with free WiFi access. 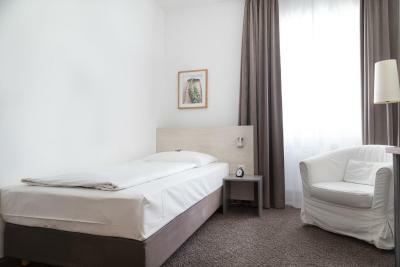 Located in Düsseldorf, it is just 2,300 feet from the famous Königsallee shopping street. Nearby attractions include the Kom(m)ödchen cabaret theater (0.6 mi) and the German Opera on the Rhine (1.2 mi). Düsseldorf Central Train Station is 0.6 mi from MAX Hotel Garni and Düsseldorf International Airport is 4.3 mi away. When would you like to stay at MAX Hotel Garni? Bright and modern room includes a coffee machine and a flat-screen TV. Hotel surroundings – This neighborhood is a great choice for travelers interested in convenient public transportation, beer and city walks – Check location Excellent location – show map Guests loved walking around the neighborhood! House Rules MAX Hotel Garni takes special requests – add in the next step! MAX Hotel Garni accepts these cards and reserves the right to temporarily hold an amount prior to arrival. Building fairly old and was clearly not built as a hotel, dodgy surroundings, feels like a budget hotel when I could have had something much higher class at the same price. Central location, fastest check-in and check-out I have ever experienced. Poor sound isolation. Was woken up at 6am from neighboring room due to wafer-thin walls. During the new year time it was completely left alone. Nobody was working. Only the cleaning lady that entered abruptly in our room twice, while we were sleeping. Breakfast was not served since there was no personnel for 3 days. Actually everything is perfect. There is a small issue, the keys for every single room is same like others, because you can lock and unlock the main door of the hotel with your room key, which mean all keys for rooms are same and people from other rooms can access to your room. Very kind staff. Excelent location. Great value for the money and would return.